Porsche specialist Paul Stephens has been modifying, upgrading and fettling 911s for years, longer even than headline-grabbing re-fashioner of rear-engined machines, Singer. From his Essex base, Stephens and his band of engineers have been giving a unique twist to air-cooled 911 models for the best part of 15 years now. The firm’s latest creation is this limited edition Le Mans Clubsport. Built to celebrate a decade of the Le Mans Classic race event, it’s limited to just 10 units, with all owners having the chance to take delivery at the 2020 event. And this isn’t just a key collection and drive away, because you also get the chance to take part in a Le Mans style starting sprint to your car that’ll be lined up on the grid, followed by a parade lap with the other ten cars. Externally the Le Mans takes its cues from the sublime, inch perfect looks of a narrow-bodied, early Seventies 911 RS, complete with ducktail rear spoiler and front skirt that features the classic oil cooler housing. However, despite the similarities to the original these hand-finished additions are totally bespoke and fitted to a de-seamed shell. Elsewhere there are neat looking 16-inch alloys, modern LED headlamps and some subtle aero door mirrors. All examples are finished in metallic white with painted black and green stripes and unique Le Mans Classic logos. It’s all beautifully done and the car’s exquisite proportions and hunkered stance simply scream ‘drive me!’. In a nod to the legendary 1973 2.7 RS you can have the Le Mans in either M471 (Lightweight) or M472 (Touring) versions, the former being stripped of its soundproofing, passenger sun visor, glovebox lid, seat tilting mechanism, central locking and electric windows, plus it gets lightweight carpets and Lexan rear windows, all of which pushes the kerbweight down to 970kg – a reduction of 100kg over the Touring. Regardless of specification you get the same green and black checked half leather trim for seats, green stitched hide covering for the bespoke dashboard and door mouldings (like the spoilers they look period, but deliver a more cohesive finish). Neat details abound, such as the green-backed instruments complete with rotated rev counter that shows the redline at the 12 o’clock position rather than buried away at the bottom right of the face, plus a 24 hour analogue clock. All cars also get bespoke leather luggage, with Touring models featuring discreet lidded storage where the rear seats once were. 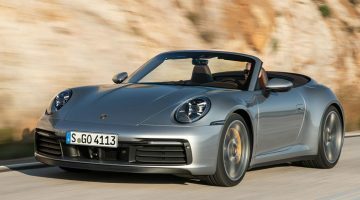 Essentially, and to oversimplify, the Le Mans is a heavily updated G-Series 911, which means you get perfect balance of classic driving dynamics and everyday usability. As mentioned, the shell is de-seamed and has the sunroof option deleted, while aluminium is used for the bonnet and Lexan for the rear and side windows of Lightweight machines. As you’d expect for a 911 of this vintage, springing is via torsion beams front and rear, but with the added advantage of a 22mm anti-roll bar at the front and a 21mm item at the rear, while bringing extra control are KW Variant 3 adjustable dampers. Braking is provided by green-painted four-pot Brembos that clamp 282.5mm discs at the front and 290mm units at the rear. Covering these are 16-inch alloy wheels wrapped in Yokohama Advan Neova rubber with a modest 205 section at the front and 225 at the rear. For the rest of the car it’s the attention to detail that stands out, even on this prototype model (the first production car has been finished to an even higher level). The mouldings for the bumpers, spoilers, door cards, luggage box and dashboard are a work of art, each hand crafted from glorious looking sketches. Each hinge, switch, fitting and component is produced to the highest standard. It’s the sort of car that you can just sit there and drink in. Hanging out over the rear axle is the enlarged 3.4-litre air-cooled flat-six from the firm’s Clubsport II model that delivers a healthy 300bhp. This figure comes not only from the extra 200cc, but also Mahle pistons and barrels, plus a lightened and balanced crankshaft and conrods. On top of that come machined RS specification cams, electronic ignition and a programmable ECU. The crowning glory of this dry-sumped unit are billet individual throttle bodies and a glorious looking, gloss-finished plenum from the 996 GT3. Not only is the specification mouthwatering, the incredibly neatly finished installation looks the part too. 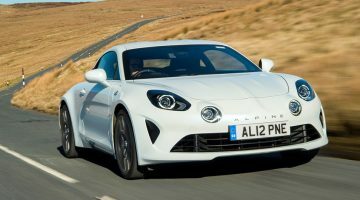 Performance is quick rather than blistering, the Lightweight needing 4.4 seconds (you can add a tenth to that for the Touring) to crack 100kph from a standing start and will head on to 273kph. On the road it feels more than fast enough. This isn’t a car that’ll rip your face off and rearrange your organs, but it covers ground as quick as the hotter hot hatches. More important is the way the performance is delivered, the acceleration building in direct proportion to the position of your right foot. It feels brisk and tractable low down, only really coming alive as the revs climb beyond 4000rpm or so, at which point the note hardens to that classic air-cooled howl and Le Mans really digs in and goes. Speaking of noise, it’s not as loud as you’d think, sounding fairly restrained at idle and when cruising, while even at full tilt the volume is restrained enough for you to make spirited progress without shattering windows and attracting the militant wing over the Neighbourhood Watch. Enhancing the car’s performance and usability is the standard G50 five-speed manual gearbox, which drives the rear wheels through a limited slip differential. The clutch requires a hefty shove, but it’s manageable even in slow moving traffic, while the shift is precise and light enough to make it an easy everyday transmission. You quickly get used to the floor hinged pedals too. The short answer? It’s pretty sensational. 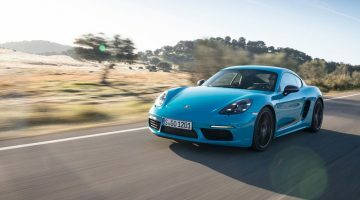 By melding classic Porsche personality with a dose of modern performance and usability the Le Mans is arguably the perfect 911 for today’s roads. Move off and the classic 911 traits are there – the steering that gently writhes in your hands, the sense of mass over the rear and a light nose bobbing in rhythm with the road. That deep dished Momo feels light initially, but quickly loads up as move off the straight ahead and cornering forces build. There’s a surprising amount of grip from the Yokohamas, the car clinging almost too tenaciously (it’s all part of that everyday remit that means the car is unlikely to catch you out if your concentration lapses) until you start to push into the very gentlest of understeer. Even lifting mid-corner results in little more than a tightening of line – this is a car designed to be approachable and sure-footed. Initially this comes as a slight disappointment, but push a little harder, remember this is a proper 911 and there’s an extra ‘driver mode’ you can unlock. Brake later and harder with the unassisted but feelsome and powerful Brembos (no ABS, but you’d need to be trying hard to lock them up, in the dry at least) to get more weight over the nose, be more aggressive with the steering and confident with your inputs and the Le Mans comes alive. Now you can exploit that pendulous mass hanging out the back, encouraging it to swing around to give you a straighter exit before pinning the throttle, shifting the weight rearward and exploiting all that traction. Delay your throttle application and you can start reveling in neatly described arcs of oversteer. It’s hugely rewarding, immersive and instinctive, the connection between driver and car so complete that everything happens almost by second nature. Yet there’s an underlying control to the way it goes about its business, the Le Mans always feeling taut and tied down. Slacken the pace and it’s surprisingly easy to live with. The ride is firm but far from uncomfortable, the noise levels are tolerably low and visibility is excellent. Only the weighty clutch and muscle required for low speed steering betrays the car’s roots. Okay, so a starting price of around $315,000 ain’t cheap by any stretch of the imagination. Even taking into account the limited run and unique handover experience it’s still a fairly sizable slice of cash. Take time to look into the build process, however, and maybe compare the car to other similarly modded 911s and the numbers start to make a little more sense. Other similar machines include the Singer 911, which by the nature of its bespoke build for every individual customer and its money-no-object materials is even more expensive. Actual figures are hard to pin down, but needless to say the phrase ‘how deep are your pockets?’ usually covers it. How about an original Seventies 911? Well, an original matching numbers ‘73 RS isn’t far off a million quid, while even a more ‘prosaic’ 2.4 S can set you back anything between $190,000 and $250,000.